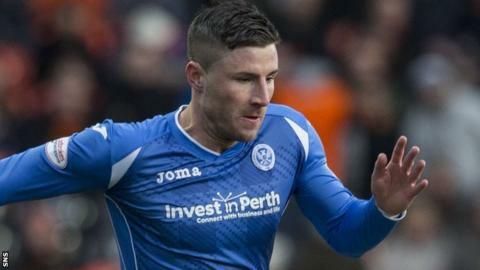 Tommy Wright reiterated that Michael O'Halloran remains a St Johnstone player despite leaving the striker out of their 0-0 draw with Hamilton. The 25-year-old has been the subject of two transfer bids from Rangers. "The decision was made purely on how I felt he was over the last couple of days," manager Wright, who thought the player was not mentally ready to face Accies, told BBC Scotland. "He's a St Johnstone player for another 18 months." Scottish Championship leaders Rangers had two six-figure offers rejected by the Premiership club this week. O'Halloran joined Saints in 2014 after leaving Bolton Wanderers and the Scotland Under-21 cap has made 23 appearances this season and scored four goals. He played for Celtic as a youth before joining Bolton and was loaned to Sheffield United, Carlisle United and Tranmere Rovers before switching to McDiarmid Park. Wright is not sure whether Rangers will continue their pursuit. "There have been bids," he said. "I don't know if there are going to be more bids, I can't do anything about that. "If you want to go to a shop and buy something, you've got to match the price tag - that's simple economics. "I know Rangers are saying they won't be held to ransom, but we don't hold anybody to ransom. We're not a big enough club to do that. "He's our player, I just felt that, on the day, it was the right thing to do. "And, with the performance of young Craig Thomson, I think I've been proved right. I thought he was excellent." Speaking before the stalemate against Accies, Wright rejected the suggestion that St Johnstone did not want to risk an injury that could deny them a transfer fee during January. "There's been no deal done, so the money doesn't come into it," he said. "My decision is a purely based on football and the frame of mind that he's in. "It's best for him to take a rest."